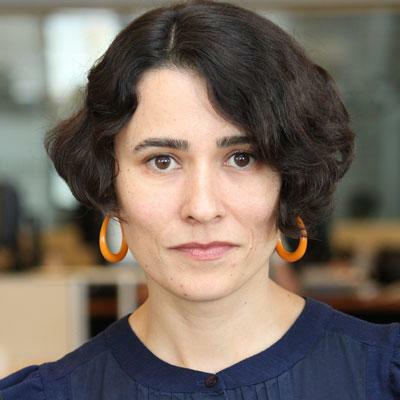 Gisele Regatao is the Senior Editor for Culture for WNYC News, where she reports, edits and curates features, news and criticism across the creative arts and the sweeping intellectual terrain that make New York one of the most fascinating places in the universe. Before that, she was Executive Producer in the News department for four years, overseeing a team of producers and hosts, and the local content for Morning Edition and All Things Considered. Gisele came to WNYC as senior producer of the daily music talk show Soundcheck. During her four-year tenure there, the program experienced an unusual spike in the number of Brazilian guests. Originally from São Paulo, Brazil, Gisele has produced radio and reported stories for newspapers, magazines and websites in New York, São Paulo, Los Angeles, Mumbai, Mexico City, and also some smaller cities. She has taught radio production at Brooklyn College, and second grade at a public elementary school in Osasco, Brazil. She was mostly proud (and only slightly concerned about her work-life balance) when her then 8 year old son asked for a radio for his next birthday. Over 90 percent of the almost 1 million tourists from Brazil who come to New York every year come here to shop. Some theater producers are trying to change that. Not even the enchanted setting of the Delacorte Theater in Central Park can make this production stormy or passionate. Woody Guthrie's "This Land Is Your Land" mentions wheat fields and dust clouds rolling — but it was written right here in New York City in 1940. A new musical is inspired by James Baldwin, who fled to Europe to escape prejudice in the United States. The piece that hung like a tapestry for 55 years at the Four Seasons Restaurant in the Seagram Building is now at the New York Historical Society. A show about pirates. Performed on the water, and it's spring. What's not to like? Creative Time's Anne Pasternak is the woman behind the Domino Sugar Factory sphinx. "Drifting in Daylight" from Creative Time features eight free, participatory artworks in the northern part of the park. It's Brooklyn, 2015. Do We Still Need a Museum? "“I just had this crazy idea, why there isn’t a place where we can all be together?” said Dustin Yellin, founder of Pioneer Works, a non-traditional art space. A New York art critic is launching Even, featuring essays, reviews and interviews. The Pulitzer board described Gregory Pardlo's work as "clear-voiced poems that bring readers the news from 21st century America." As the Brooklyn Museum is looking for a new leader, we explore what museum directors do, and what we expect from them. A new show features Chinese-inspired gowns by designers like Alexander McQueen, Yves Saint Laurent and Guo Pei, who created that yellow dress for Rihanna. At 82, the actress can command an audience with a tilt of her head, and get us to root for greed and revenge. "The love child of Bjork and Seinfeld" should be the next director of the Brooklyn Museum, said comedian Negin Farsad. "That would get the craziest, funniest stuff." A theater documentary explores the personal experiences of five Muslim New Yorkers. Anne Hathaway portrays a drone pilot in this one-woman show directed by Julie Taymor. "Fun Home" transforms cartoonist Alison Bechdel's graphic memoir into an affecting, yet buoyant, chamber musical.